British Prince Harry is followed by Argentine Nacho Figueras, captain of the Black Watch polo team. New York (CNN) -- It's the stuff of fairytales: princes, horses, polo, beautiful dresses, champagne flowing and of course the hats! 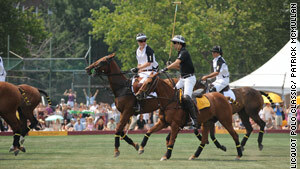 The princely pageantry marked the 2010 Veuve Clicquot Polo Classic on New York's Governors Island, Sunday afternoon. The event brought a flock of people from celebrities, to Connecticut housewives, to investment bankers to shop clerks to royalty. Both England's Prince Harry and Lesotho's Prince Seeiso attended the event to raise money for the American Friends of Sentebale. The two royals are patrons of Sentebale, which aims to help Lesotho's orphans -- the victims of poverty and HIV/AIDS. Prince Harry, who is third in line to the British throne, played for the Black Rock team and took a head-first fall off his pony during the game. His team lost. Guests in attendance included celebrities such as Susan Sarandon, Carol Alt, Ivanka Trump, Julianna Margulies, and Mary J. Blige. So what draws these women to an event like this? Do women still crave the little-girl fantasy of Cinderella waiting for Prince Charming? Is good old-fashioned chivalry and elegance such a far cry from today's modern American Casanova who says, "Hey babe, dinner and movie? Split the check?" The answers were surprising. "I found my prince -- he's a hockey player and we met at an NHL event, the last place I'd ever expect to meet someone, but there he was," super-model Carol Alt said of Alexei Yashin. "You don't need to come to an event like this to find your prince. In fact, take a look around in everyday life, your prince can be anywhere," said the the 50-year-old, 5' 9" beauty. When asked if she follows the sport of polo, Alt laughed and said, "I'm here to support my friend Nacho [Black Watch team captain Ignacio Figueras] and an amazing charity for children and to stomp the divots with my shoes." We all remember the scene in the movie "Pretty Woman," when Julia Roberts and Richard Gere attend a polo match and stomp those divots. "When we were driving here today, we thought of that movie 'Pretty Woman,' " said Amanda Scalzo and Kimberly Rose of Connecticut, who enjoyed the match outside, under Veuve Clicquot umbrellas. "We came here because we wanted to do something cultural and dress up and wear our hats," said Scalzo, who works as an administrative assistant during the day and bartender by night in Connecticut. "And of course, we're here to meet interesting new and diverse people and maybe even a nice man," said Kimberly Rose. When asked if they hoped to meet Prince Harry or the handsome Figueras, a Ralph Lauren model as well as a polo star, both laughed, saying Prince Harry is too young and Nacho is married. Some things haven't changed since the days when polo was known as the sport of kings. For example, the event was divided into four levels or classes of access. In the closed off VIP section ticket-holders paid upwards of $35,000 per table (approximately $3,500 per seat) and were treated to a seated luncheon in the same room as Prince Harry, who was surrounded by security. The second tier of VIP seating was farther from Prince Harry, with tables costing $20,000. The third tier was outside the tent: a picnic basket luncheon for $250/person. And finally on the opposite side of the polo field, far away from everyone else, the free general admission to the public who could watch the polo match from bleachers. Asked why people are drawn to such an event, one young attendee, Sam from Florida, said, "The women are all here because they are a bunch of gold-diggers. And the men are here to drum up business and network." Poor Cinderella is getting a bad rap -- after all weren't her evil stepsisters the gold-diggers?